iShows Movies keeps track of all your watched movies, with a gesture driven UI, letting you favorite them and fully customize the way you browse your content. Never miss a film again! iShows movies lets you find movies in a simpler, easier way. Just tap on the upper right + icon to switch to Discover! Browse through Trending movies, Popular ones or see our own curated selection. If you want to narrow down your list, you can use the genre filters in both Trending and Popular movies. But if you prefer the old school text input method, you can always use search. Remember: you can make a long tap gesture in the add icon to go directly to the search field. 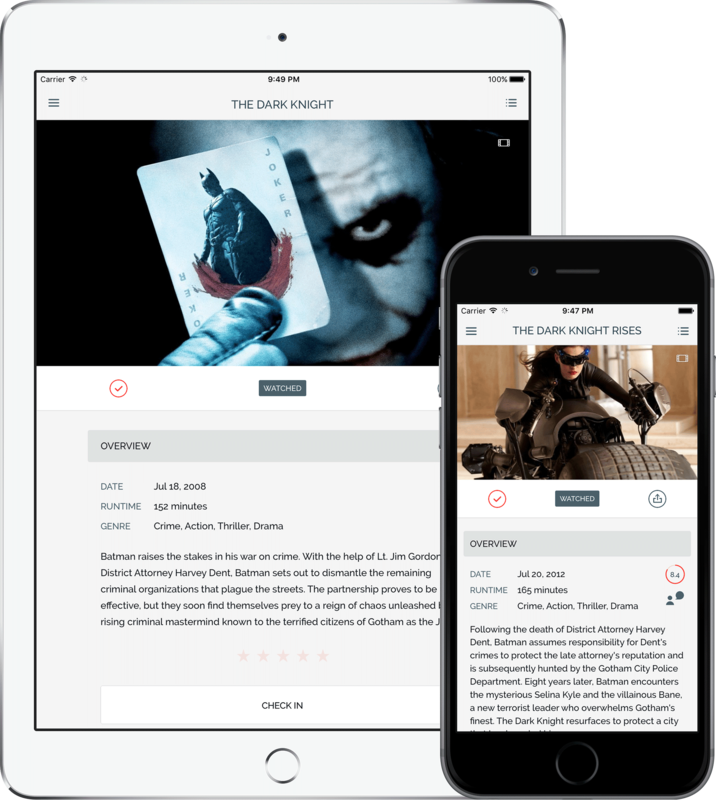 Using a Trakt.tv account, all your devices will be synced with your up-to-date movies information. You will also get movie recommendations based on your watched history and even know which movies your friends have watched. We highly recommend you to link iShows movies with Trakt.tv as soon as possible. That way you'll have a cloud backup for your info and all your iOS devices up to date. Experience your movies like you want! iShows movies offers you an incredible level of customization. You can change the UI choosing between light and dark themes and more than 5 hilite colors. You can also change between poster or fanart layouts, and choose the cover you like most in both layouts. And don't forget to try the condensed layout. Finally, you may want to change the whole iShows UI using one of the movie genres themes available once the movies limit is removed (IAP required).